Pope Benedict XVI named U.S. Archbishop Raymond L. Burke to the Congregation for Bishops on Oct. 19, a significant appointment that could have an impact on the wider church for many years to come. The congregation’s members review candidates for vacant dioceses and make their recommendations to the pope. 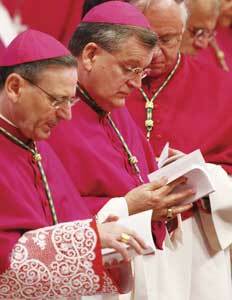 The Congregation for Bishops is considered to be one of the most important Roman Curial agencies. Membership on the congregation is a five-year appointment, which can be renewed until a prelate’s 80th birthday. Archbishop Burke, 61, will help shape the episcopate not only in the United States but also around the world. Formerly archbishop of St. Louis, Archbishop Burke was named in 2008 as head of the Vatican’s highest tribunal, known as the Supreme Court of the Apostolic Signature. At the time, pundits wondered whether the appointment would in effect sideline the man who had been one of the most outspoken U.S. bishops on moral and political issues. Archbishop Burke has been anything but silent, however. Since his Vatican appointment, he has insisted that holy Communion be refused to Catholic politicians who actively support legal abortion. He also said the Democratic Party in the United States “risks transforming itself definitively into a ‘party of death’” and argued that nothing can justify casting a ballot for a candidate who supports “anti-life” and “anti-family” legislation. In mid-October, he celebrated a pontifical high Mass in St. Peter’s Basilica using the 1962 Roman Missal, commonly called the Tridentine rite—the first time that has been done at St. Peter’s in almost 40 years. Archbishop Burke will join about 30 other cardinal and bishop members of the Congregation for Bishops, which meets regularly every two weeks. The meetings last all morning, and typically bishops’ appointments for four dioceses are reviewed at each session. Before the meeting, congregation members are sent abundant documentation on the candidates for each diocese, information collected by the apostolic nuncio in the country where the diocese is located. A large part of the packet consists of written evaluations prepared on request by some 30 to 40 people who know the candidate. At the congregation’s meeting, one member acts as the ponente, or presenter, who reviews the information and makes his own recommendation on the terna, or list of three candidates. Each member, in order of seniority, is then asked to give his views—in effect, offering a judgment on whether the candidates are worthy and suitable, and in what order they should be recommended. The congregation’s overall recommendations—along with any doubts, questions or minority opinions—then go to the pope. He usually approves the congregation’s decision but may choose to send it back for further discussion and evaluation. Insiders say the preparation work for each meeting takes many hours. “It’s a very serious procedure because a bishop has a heavy responsibility in the church. It’s an exercise in prudential judgment, and the weight of it is felt by everyone involved,” said one Vatican official. Archbishop Burke joins three other U.S. members of the congregation. Two of them, Cardinal Bernard F. Law and Cardinal J. Francis Stafford, reside in Rome, while the third, Cardinal Justin Rigali, is the archbishop of Philadel-phia. While congregation members give particular attention to appointments in their native countries, more often than not they are looking beyond their home borders: In 2007, for example, of the 179 bishops’ appointments handled by the congregation, only 13 were in the United States. This article also appeared in print, under the headline "Burke Named to Congregation For Bishops," in the November 9, 2009 issue.